Take the cinema with you wherever you go, with the immersive 10.5 inch screen and speakers featuring Dolby Atmos surround sound. Control your home and smart devices from your tablet. And keep any little ones entertained nice and safely, with the latest version of Samsung Kids Mode. Explore outer space. Sail the seven seas. Survive on a desert island. With the Galaxy Tab A's immersive 10.5 inch screen, you can really lose yourself in the latest blockbusters. Want the full cinematic experience? With Dolby Atmos surround sound, that's exactly what you'll get. Just add popcorn. Life's busy. Make it simpler with the Galaxy Tab A 10.5. Dock your tablet in the heart of your home and use it to help you run your day. Keep the kids entertained - it's your very own entertainment hub. Control any SmartThings enabled devices, like thermostats or smart plugs. And get important updates, to help you stay on top of things, from the Daily Board feature. Ever settled down to watch a movie, only to find your tablet's out of battery? We've all been there. The Galaxy Tab A 10.5 has fast charging, so your popcorn will still be fresh by the time you press play. Just need a moment to yourself? 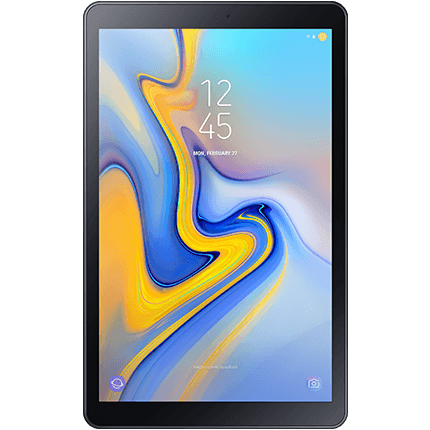 The Samsung Galaxy Tab A 10.5 comes with the latest version of Samsung Kids Mode, which provides a safe way for your kids to play and get creative. Set time limits and passwords, and allow only the apps you want your kids to play with. So you can hand over your tablet, knowing your kids can't access anything they shouldn't.